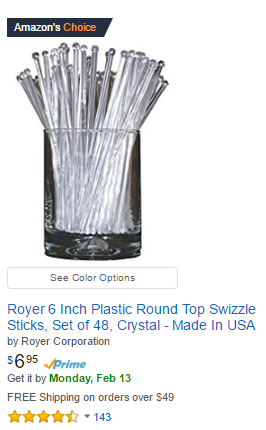 6" Round Top Swizzle Sticks have been a perennial top-seller for Royer Corporation since the late 1970's. Because of this, it certainly isn't a surprise to see their Amazon listing sporting a distinct "Amazon's Choice" badge when swizzle sticks are searched for. High sales volume, positive consumer reviews & top-notch, USA-made quality have likely aided Amazon's decision to put their name behind our iconic Round Top Swizzle Sticks. If you're looking for great stirrers in a small quantity at a great price, hop over to Amazon and pick up a bag or two today. We have 9 colors to choose from! If you would like to see more of our swizzle sticks click here!